I’ve gotten to that point in pregnancy where, despite exhaustion, sleep has become elusive because I can’t maneuver myself in bed quite as nimbly as I once could. 3-4 hours a night is nice, compared to the amount of sleep I had in most of 2013, but it gives my mind much too much time to wander aimlessly into it’s darkest corners at these quiet hours of the night. The nesting urge has been overwhelming lately. I’ve been trying not to fight it as much. I’m stuck somewhere between being terrified to jinx myself, and needing desperately to do something that makes me feel like this pregnancy isn’t doomed to repeat history. I’ve been insistent, and remain so, that I don’t want anyone to purchase anything for this baby. Not until it is here safe and sound. There won’t be a baby shower. In fact, I’m pretty confident in the fact that I won’t ever be attending another baby shower, ever. But despite that, part of me feels the need to make a few purchases, just to convince myself that this isn’t just some elaborate lie I’ve made up in my head to ease myself of the pain of losing Everlee. I’m stuck somewhere between a rock and a hard place, so I’m trying to find a comfy piece of grass to curl into the fetal position in between. In the meantime, the isolation is slowly eating away at my brain. The best rest isn’t so bad, but the loneliness is exhausting. It’s hard to have people visit too when you’re in no state to play hostess to them. The idea of having people in my house and not entertaining them is stressful to me. I feel like I should have food and drink and things for them when they’re here, and I’m just not capable of that. An every so often I just feel myself fall to pieces from the loneliness of it all. But my wonderful nurses, they see that. They see that living in a constant state of being an incubator can take a toll on the mind, and they assess the situation and every so often grant me a short spurt of parole where I can ride in the car and get my own coffee at Starbucks, so I can see normal humans interacting and be assured that the world continues beyond the walls of my house and the hospital, the hospital and my house. Lather, rinse, repeat. I’m not complaining. I’m taking every possible second to enjoy the mechanics of this pregnancy. Every wiggle and every poke. 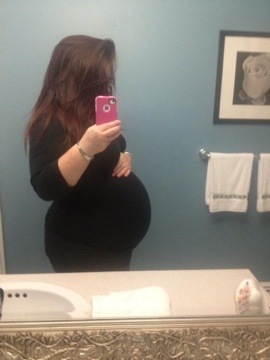 I revel in the shadow of my swelling belly, and I enjoy every moment of singing and talking to my wriggling belly. I don’t take a second of my time with this growing baby for granted, because I realize in a heartbeat it could all change. I just wish sometimes that I could live in that place of ignorant bliss where being pregnant and having a nursery and feeling kicks and picking out names actually means you’re coming home with a baby. But I know better. I just hope for better. But it’s 6:25am. I’ve been awake since 2. It’s probably time I try to sleep for another hour, and dream sweet dreams where nothing’s real, and nothing hurts. The folks over at the American Recall Centre contacted me earlier this month and asked me “who is your health hero?”. When I was asked to write this piece, clearly the answer for me was simple. When I think about the person who has motivated me the most to become master of my own health destiny there is only one clear answer: my beautiful daughter Everlee. To understand why this is we have to look at this story in three parts, the before, the during and the after. Before Everlee I had always known I wanted to be a mom. I was born to be a mother. But we don’t always manifest our own destiny without a lot of hard work. Shortly after I was married in 2010 I discovered I was part of a large but seemingly silent group of women who suffered from infertility. Although doctors have never been able to give me a reason for this, in my quest to become a mother I became more in tune with my body, especially in the most womanly of ways, than I had ever been in my life. I got to know intimate parts of my own life that I had never dared explore before. I knew more about cycles, and ovulation and implantation than most OBGYN students. I learned that sometimes in a quest to fulfill oneself, you have to learn to check your dignity at the door. I got to know myself better than I could have ever imagined possible. It look a long two years and a lot of emotional turmoil, but in July of 2012, to my surprise, I found myself pregnant with my first child. As any mother of a biological child will tell you, during pregnancy your body becomes anything but your own. My daughter, my very reason for being, was living inside of me, being nurtured and growing healthy and strong in preparation to life the life of love and happiness I longed to give her. Because of her I became more healthy and more aware of my body than ever before. Every single decision I made was no longer for myself, but for the survival and health of my child. My body was no longer just a vessel that got me from point a to point b, it was a home. I was so blessed to feel her kicks and tumbles every day that told me she was happy and healthy in the cozy little home I was making for her. But some things never work out as planned. Early in my third trimester, despite my best efforts to provide my baby girl with the most healthy body possible, I was diagnosed as preeclamptic. And on February 12, 2013 I suffered a complete placental abruption. 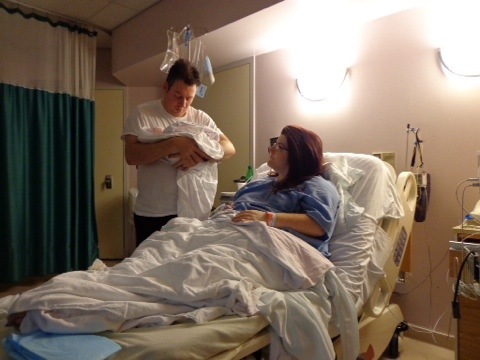 February 13th at 1:16pm I gave birth to my gorgeous baby girl. Stillborn. Life after Everlee was, and continues to be devastating. There isn’t a day that passes that I don’t miss her gorgeous little face and think about not only the loss of her life, but the loss of all of the potential that died with her. But in order to continue to strive towards my dream of being a mommy. Every single moment with her was special. Her entire life she was inside of me, being nurtured and loved. She was conceived, lived and died within my body, I was her world, I was with her every second of her existence and I am endlessly honoured. I see the beauty in it. Since Everlee, I have learned that I have to love and understand my body better than anyone else if I’m going to bring her little brother or sister into the world safely. Now at 25 weeks pregnant I am more in charge of my own health than ever before. I owe that to Everlee. Because of her I have no problem with standing up for myself and asking the questions I may have been afraid to ask in the past. I’m not afraid to ask for help, and speak up when something just doesn’t feel right. Before Everlee I never would have done that. But because of her, because she was here and because she mattered, I now matter more to myself. She may not have been here for very long, and she may have been the tiniest little being, but that little life spoke volumes. She is, and always will be, my hero. I love you Everlee.